​Kevin was a right-handed batsman who bowled right-arm medium-fast. 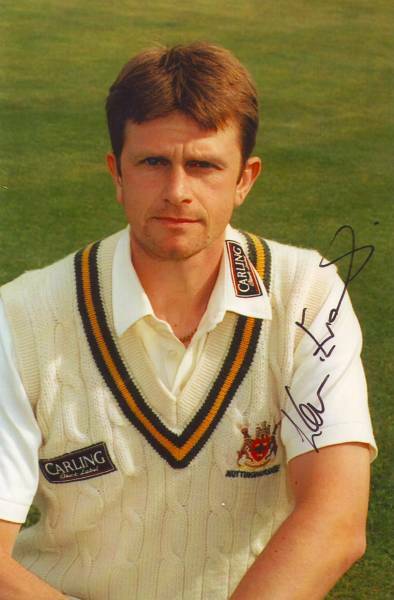 Having played for the Nottinghamshire Second XI since 1981, Evans made his first-class debut for Nottinghamshire against Cambridge University in 1984 at Trent Bridge. He played two further first-class matches in his debut season against the touring Sri Lankans and West Indians, as well as making his List A debut against Middlesex in the 1984 John Player Special League.First-class and List A appearances were few and far between for Evans between 1984 and 1987, but he eventually broke into the Nottinghamshire side on a regular basis in the 1988 season. Below : Nottinghamshire County Cricket Club at Trent Bridge in Nottingham, circa April 1987. Bruce French, Eddie Hemmings, Derek Randall, Tim Robinson, Ken Taylor, Clive Rice, Chris Broad, John Birch and Mick Bore.